The time was particularly tense at Fairchild AFB. On Monday, June 20th, 1994, a lone gunman, Dean Mellburg, entered the Fairchild Hospital Annex with an AK-47, and killed 2 Air Force members and 3 civilians, while injuring 23 others, before being shot & killed by a responding security police officer, who happened to be riding his bicycle nearby. After some discussion and debate on the matter, it was decided by the base's leadership that Fairchild's annual airshow would go on ahead as scheduled, to aid in the healing process of the personnel still at the base. That meant, of course, that pilots who would be performing in the show needed their practice. And so a practice session was scheduled for the morning of June 24th. On that morning, however, Secretary of the Air Force Sheila Widnall and United States Congressman (and then-Speaker of the House) Tom Foley visited the base, so the takeoff for the practice session was delayed until the afternoon. The flight profile's greatly exceeded the aircraft's limitations and Air Force regulations, but after a briefing with the Wing Commander, Colonel Brooks, the flight was allowed. Czar 52 begins to execute a "wingover" maneuver, banking into a 45 degree roll, then a 60 degree, then the unthinkable! A fraction of a second before impact - note the ejection hatch being flung from the cockpit. At 1:30 PM, a Boeing B-52H "Stratofortress", tail number 61‑0026, taxied to runway 23 for departure. Carrying the callsign of "Czar 52", and assigned to the 325th Bomb Squadron of the 92nd Bomb Wing at Fairchild Air Force Base, Washington, the bomber and its crew of four launched shortly before 2 PM in the afternoon to practice maneuvers for an upcoming airshow. Piloting "Czar 52" for the flight was Lt. Colonel Arthur A. "Bud" Holland, the Chief of the 92nd Bomb Wing Standardization and Evaluation branch, 24 year Air Force veteran, and an instructor pilot. The copilot was Lt. Colonel Mark C. McGeehan, of Chester, West Virginia, also an instructor pilot and the 325th Bomb Squadron Commander. Also aboard the bomber for the flight was Lt. Colonel Kenneth S. Huston, of Avenal, CA, the 325th Bomb Squadron Operations Officer, who was sitting in the radar navigator position. Lastly, and added to the flight at the last moment, was Colonel Robert E. Wolff. A native of Chicago, Wolff was the Vice Wing Commander, and was added as a safety observer by the Wing Commander. This was to be Wolff's "Fini-flight," a tradition in the Air Force by which an aviator is hosed down following his last flight in an aircraft. Upon landing, Colonel Wolff was to be met on the flight line by his wife and friends for a champagne toast to the end of a successful flying career. However, upon preparing to land at the end of the practice air show, the crew was required to execute a "go-around" or missed approach because of another aircraft, a large KC-135 aerial re-fueling plane, on the runway. Midway down the length of the field, Czar 52 began a tight 360 degree left turn around the control tower at only 250 feet above the ground . About two thirds of the way through the turn, the aircraft rolled past 90 degrees. The plane stalled after losing its vertical component of lift. Slipping downwards, its port wing clipped a set of power lines, and plowed into the ground at 170 mile per mile, igniting a giant fireball, and flinging wreckage out in all directions. Photographic evidence would later show that at least one of the crew attempted to eject, but none survived the crash. Remarkably, the only piece of the plane to enter the weapons storage area was a flap from the right wing - which can be seen fluttering away from the impact site in the video. Among many flyers of the BUFF (a nickname among pilots for the B-52, meaning 'Big Ugly Fat Fellow'), Colonel Holland was, up until the crash, considered a living legend. Pushing the aircraft to its absolute limits, he also had earned a reputation as a "hot stick." According to records, he once forced a bomber to climbed so steeply that its fuel flowed out of the vent holes on top of the wing tanks. Another time, he popped an estimated 500 rivets while performing a prohibited climb at an airshow, and even performed an unauthorized "mini air show" over the high school of one of his daughters, placing a BUFF into a "death spiral", pulling out of the maneuver at the last second. Then, three months before the crash at Fairchild, while flying at the Yakima Bombing Range, he buzzed a photographic crew atop a ridgeline, clearing the top by an estimated three feet. His co-pilot on that flight claimed that he had to wrestle control of the craft from Holland. Among the junior officers and flight crew of the squadron, Holland was considered a "rogue pilot" - who is alleged to often talk about his goal in flight - a complete rollover of a BUFF in flight - something that had never been done successfully by anyone. McGeehan recognized the potential for danger, and had attempted repeatedly to have Holland grounded. But the senior leadership in the 92nd Bomb Wing did not see what McGeehan had observed, so the requests were denied. And so, McGeehan did the one thing within his power at that point - he forbade his pilots from flying with Holland. And so, when Holland was flying on the practice mission on that day - in the co-pilot's seat sat McGeehan. A subsequent Air Force investigation found that Bud Holland had a history of unsafe piloting behavior and that Air Force leaders had repeatedly failed to correct Holland's behavior when it was brought to their attention. 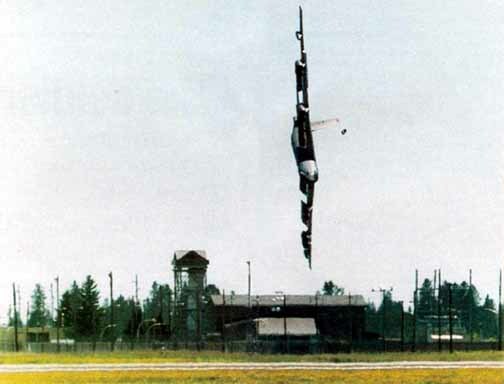 Since the time of the accident, this particular mishap is often used as a teaching tool with military personnel, like at the United States Air Force Academy, in the importance of complying with safety procedures, and correcting or reporting the behavior of any who disregard safety regulations. On July 1, 1994, the 92nd Bomb Wing was re-designated the 92nd Air Refueling Wing (92 ARW), and Fairchild AFB was transferred from Air Combat Command to Air Mobility Command (AMC) in a ceremony marking the creation of the largest air refueling wing in the Air Force. 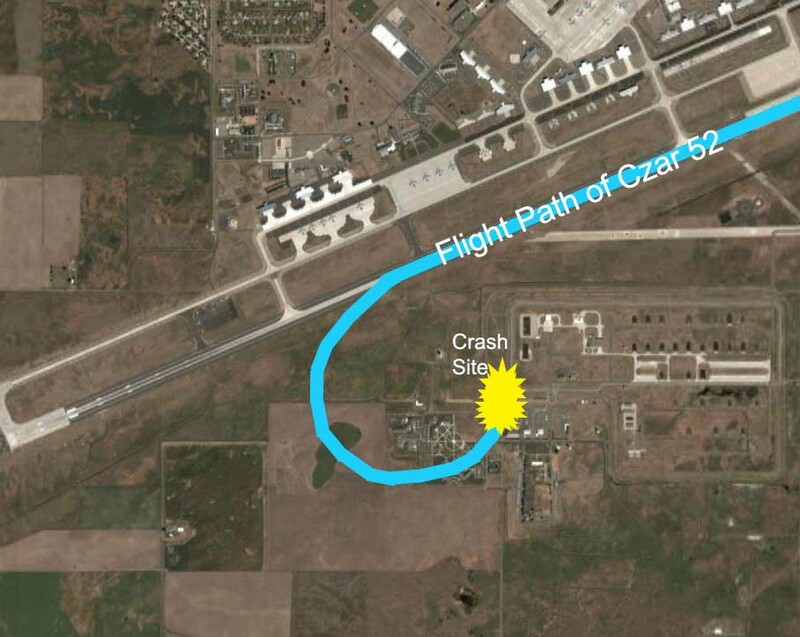 The bomber crashed on the south side of the only runway at Fairchild AFB. 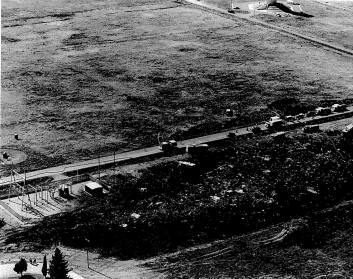 Blackened parts of the fuselage were strewn across about five acres, with most wreckage concentrated in smaller area about one-half mile from the airstrip pavement and southeast of the base control tower. 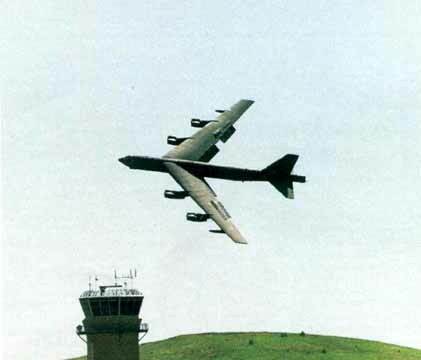 The only recognizable part of the unarmed B-52H was the right horizontal stabilizer, jutting about 15 feet off the ground vertically. The crash site is near what used to be a nuclear weapons storage facility. It is believed that Holland's turn was to avoid flying through the restricted airspace over the facility near South Arizona Avenue. Also near the crash site is Fairchild Survival School. The survival school was in used, by between sessions. Many of the students there witnessed the crash first-hand.